Home bees car health health news honet new SWARM OF BEES video SWARM OF BEES FOLLOWS CAR FOR 2 DAYS TO RESCUE QUEEN TRAPPED IN BACK! 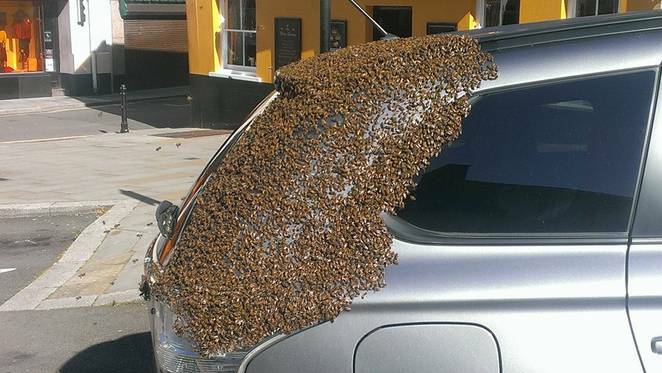 SWARM OF BEES FOLLOWS CAR FOR 2 DAYS TO RESCUE QUEEN TRAPPED IN BACK! I was a little bit concerned, with it being in the middle of town outside a pub, that someone might do something stupid and get hurt or do something stupid and hurt the bees,” he said. “The next day I realized that some of the bees had followed me home,” she said. So she summoned the beekeepers, who arrived ready for rescue.